Mickey is a castaway, stranding on a tropical island. 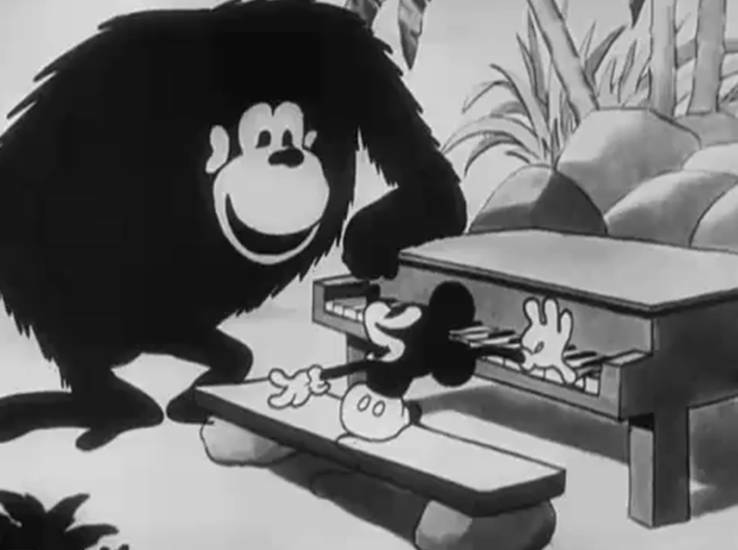 Luckily, a piano is washed ashore as well, so Mickey performs for the jungle animals inhabiting the island. Unfortunately, an obnoxious little tiger disturbs him, and a great ape wants to play the piano, too, wrecking the instrument. ‘The Castaway’ was a short made out of rest material, and it shows: Mickey’s looks are wildly inconsistent, there’s not even a hint of a story, and the whole film feels like a throwback to 1929. Nevertheless, this short contains nice effect animation of waves washing ashore. It also reuses some animation of dancing sea lions from ‘Wild Waves‘ (1929) and of a dancing ape from ‘Jungle Rhythm‘ (1929), the film with which ‘The Castaway’ has most in common, which is no advertisement. In fact, Walt Disney disliked the film, thinking it didn’t look like a Walt Disney picture. And indeed, it hardly does. The gag in which a lion gets eaten by a crocodile was borrowed from a very early Mickey Mouse comic strip from February 1930, which incidentally was the last panel drawn by Ub Iwerks himself. ‘The Castaway’ is also noteworthy for being the first Disney short to feature music by Frank Churchill, who would score many Disney shorts, and who would become particularly famous for the hit song ‘Who’s Afraid of the Big Bad Wolf’ from ‘Three Little Pigs‘ (1933) and the songs in ‘Snow White and the Seven Dwarfs’ (1937). I liked it. Much action and a piano that always brings music, not just notes! Also here again: well known music and own silly music!